Born 1955 in Morocco of French parents, Jean-Paul Courchia moved to the Provence region of France in 1964. Here he began his career as an artist with his first exhibition in 1981. In 1994, the prestigious Jouvene Gallery of Marseille started to represent his works. Jouvene has been associated with some of the finest French painters including Cezanne and Van Gogh. With the addition of Courchia they continue their support of the traditional Provençal landscape painting. Courchia shares many common features with he best-known Provençal painters. These include a deliberate forcefulness and willful expression of emotional power. the exaggeration of volume, color and line are also manifest in Courchia’s process, often through distortion. His compositions are enhanced by superimposing broad strokes of color and light over scenes of everyday life. His canvases are serene reminders of the past. His simplification of objects into shapes and broad bans of color disguises a complexity of emotion. His dramatic use of shadows and reflections give motion and vitality to his works. The absence of figures does not imply a barren or abandoned landscape devoid of life. The colors and shapes themselves are the life of Courchia’s paintings and they are as striking and animated as any human figure, if not more so. Gallery Revel, New York began their relationship with the artist in 1998, bringing the painting of Provence to the Americas. In June of 1999 and again in 2005, the National Arts Club in New York hosted a one-man show for Courchia. 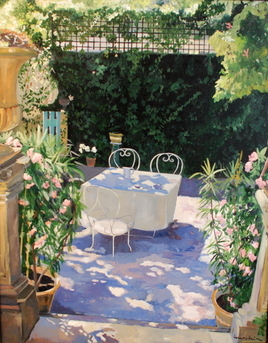 His work has great appeal, bringing the warm sunshine and leisurely life style of Provence alive on the canvas. Thematically his paintings concentrate on the subjects most associated with the region, i.e. the cafes, the hidden gardens, the harbor and the magnificent views. What typically attracts the viewer is the contrast between the simplicity of style and the complexity of emotion.